Gingerbreadhousekit SA Review and GIVEAWAY!!! Everybody has that one piece of fabric that’s connected too emotionally to throw away yet too old to be worn. They are mostly stacked at the bottom of the dresser drawers or in the darkest corners of the wardrobes, where it is most likely to be never seen again. Holding on to clothes that we do not use prove to be a complete waste if one doesn’t believe in donating or selling them. So let’s bring out the old pieces of fabric and try some crafts. Free Father’s Day Card Printable! I got this idea for this year’s father’s day printable, let me know what you think! DIY All-in-One Household Cleaner for less than a Rand! Quick & Easy Sensory Clay (microwave) & Printable colour chart! I like this rough grainy clay as its good for sensory development for small toddlers and the shape of your characters stay in place much better when it has something rough to hold on to. This recipe is so easy your kids can make it! I made this batch twice to make sure it doesn’t clump when making one big batch but maybe it will work for you? Let me know! Mix all the ingredients except the food coloring. Separate the batch in two if you want more colors. Add the food coloring and put in microwave for 30seconds. If its not firm and still stick to your hands, put it back into the microwave for another 30secs. If it still sticks, add a little flour and repeat. I ended up with 5 colors because I made the batch twice and then took a little of the blue and a little of the purple and added yellow to get that awesome stone grey colour. Having trouble figuring out the colours? 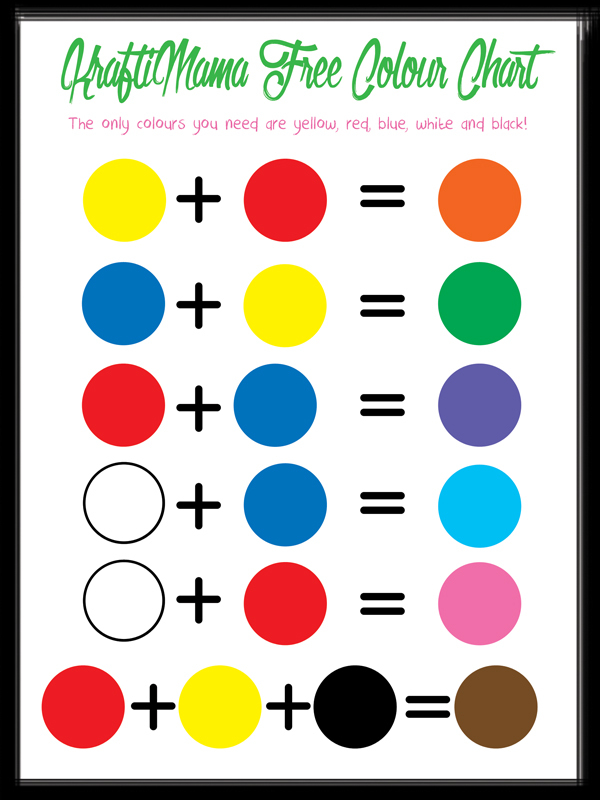 Here’s a free printable colour chart! When my son got a bad case of eczema as a baby I started making this washing powder thats all natural chemical-, irritant- and bad-stuff free. Not only did his eczema go away, I also saved lots of money on washing powder and dishwasher pods. Its easy and really cost effective if you buy the ingredients in bulk. Spread 2kg bicarbonate of soda (bicarb) in a thin layer over baking trays. Bake at 200 degrees Celsius for 1hour. Bicarb is fluffy and shiny but when it is ready it will be dull and grainy. The chemical process actually now makes it washing soda and the weight will have reduced to about 1,5 kg. Mix the washing soda with 2kg Bicarb and 1kg Epson Salts. You may want to divide that beforehand into two bowls to be able to mix it if you don’t have one very large bowl. You can add an additional few drops of essential oil and mix it through… I prefer lemongrass. Store in an air tight container until needed. For softener I use half a cup of Vinegar in a large load. Its not as soft as store bought conventional softener but it does the trick and I am willing to sacrifice as much for the environment! From the Washing Powder recipe above, take 2 cups and add enough lemon juice to make it sticky and clumping. Fill ice cube trays (not so much that it won’t fit into the pod holder) and push down with gloves or cover with cling wrap because as it can very abrasive and drying on your hands. Leave in the sun for a day or two to dry out… It is ready when you can pop it out of the tray without it breaking. You can use a tablespoon or two of the powder as it is as well or add a little citric acid to make it fizz. Use salt as normal and Vinegar as rinsing aid. For more natural recipes, click Here!